SPLENDOR in the ''SLOW LANE!'' You will be in total ''relaxation'' mode after you purchase this beautiful condo @ La BRISA! You have the ''package deal'' here with a beautiful waterfront view in the distance, a well-run condo association with terrific amenities and ease of lifestyle in a secured building with elevator. This home is ready for you to put your personalized stamp on and furnish to your fancy. Nice foyer entry w/utility closet & beautiful open floor (not all units @ La Brisa have this open floor plan). TOTALLY renovated kitchen: solid wood custom built cabinets w/pewter pulls, stylish glass tile backsplash, all upgraded Kenmore Elite stainless appliances include a refrig./freezer with filtered water in the door, brand new dishwasher in 2018, radiant range/oven, largekitchen window to allow terrific sunlight to fill the kitchen, track lighting above the very spacious granite counter top/breakfast bar, which creates a lovely spot to watch the chef create the fine meal or to have a casual meal @ the counter. To complement the already abundant kitchen cabinet storage are 2 quality rolling Metro storage carts from The Restaurant Store. Track lighting with 2 Halogen pendant lights on dimmer is above the breakfast bar, together with soft illumination above & below the cabinets. There is so much detail, including tile under all appliances & cabinets, should one embark on a different arrangement in the kitchen (not sure why, as it is open, lovely & quite functioning!). Open living rm./dining room design concept enhances the square footage. The entire unit has white ceramic tile throughout with upgraded porcelain tile in the bathrooms when recently renovated in 2017. One steps directly from the liv. rm. or master bdrm. 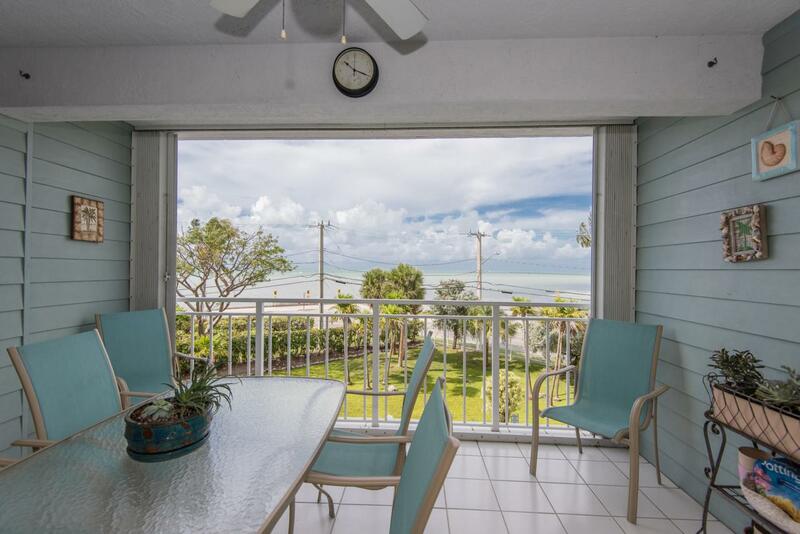 onto a very spacious (approximately 11 x 12') tiled veranda where you savor the sunrise colors in the sky, overlooking the lower end of Smathers Beach w/terrific Southern ocean breezes. Your expansion of indoor & outdoor living become one! There is a complete complement of accordion & rolldown storm shutters for all doors & windows. The master suite is quite spacious (approximately 15 x 13') with a large window & direct access to the veranda. Bathroom renovation includes porcelain tile, all new soft close cabinets, quartz countertop with glass tile backsplash, new mirror & lighting, soft touch toilet flush, linen closet & new beveled glass partition in the fiberglass tub. There is a glorious, large walk-in closet with outlet in the master. There is a hallway off the foyer leading to the guest bdrm., with another pantry or storage closet & separate large louvered door closet with side-by-side front load dryer & stainless steel drum in washing machine, both only 1.5 yrs. old. The guest bdrm. is spacious, as well, approximately 12 x 13', with a double closet with louvered doors. There is a "Jack & Jill" en suite upgraded bathroom, new vanity, quartz countertop, large mirror, and walk-in fiberglass shower with beveled glass doors. So many OUTSTANDING APPOINTMENTS in this pristine condo!!! The condo amenities include security, secured building with elevator, on-site manager, heated large tropical community pool, clubhouse building, sauna in each men's & ladies' bathrooms, covered parking & storage room for this unit (not all have this), tennis court, chickee hut & bar-b-que area. Smathers Beach is unobstructed & directly across the street. The wide, wide sidewalk along the beach is ideal for biking, walking, rollerblading and jogging. Ideal location, close to shopping, a comfortable bike ride to Old Town if one is so inclined, and moments away from the airport. There are community activities and real comradery with the owners, tenants and "snowbird" residents, who have been visiting for many years. La Brisa provides a "real community" feel. I would love to provide a personal tour for this impeccable, lovely unit & stroll through the common areas. I'm just a phone call away! Listing courtesy of Robin H Mitchell of Keller Williams Key West Compass Realty.